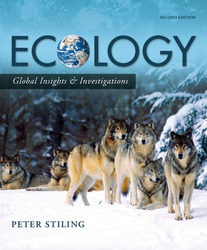 Peter Stiling, co-author of Biology by Brooker et al., has introduced a new ecology text to the market. The main goal of this latest ecology text is to show how ecology is important in understanding global change. The book's main objective is to teach the basic principles of ecology and to relate these principles to many of the Earth's ecological problems. One of the main changes to Ecology: Global Insights & Investigations 2e, has been to simplify some of the more difficult concepts that students found challenging, such as population growth and diversity indices. The author's overall goal has been to make the material more accessible to students, therefore more explanatory captions have been included on the art work and subsection headings have been added to the summaries. The book's main goal is to teach the basic principles of ecology and to relate these principles to many of the Earth's ecological challenges, of which there are many. Each chapter contains a “Global Insight” feature which highlights how such global change is important in all areas of ecology, from behavior to ecosystems. Each chapter begins with an outline consisting of the main section heading contained within each chapter. These headings are written in the form of an ecological statement which summarises the material within each section. A “Feature Investigation” in most chapters outlines a hypothesis being tested, the methods researchers use to perform their studies, the data they collected and the conclusions they reached. Some of these Feature Investigations are classic studies; others contain cutting-edge research and techniques. Chapters are built around the art. Important ecological terms are boldface. Each chapter ends with a unique summary that specifically links each main concept with its corresponding piece(s) of art. There are 10 multiple choice self-test questions with answers that can be accessed online at the book's web-site. There are also 3 - 5 broader conceptual questions that require essay answers of a paragraph or longer. All these questions refer to material that is explained within the textbook. To highlight the importance of understanding graphs, images, or observations, most chapters also include a “Data Analysis” question that provides data sets and asks the student to analyse the data and provide an explanation or conclusion.